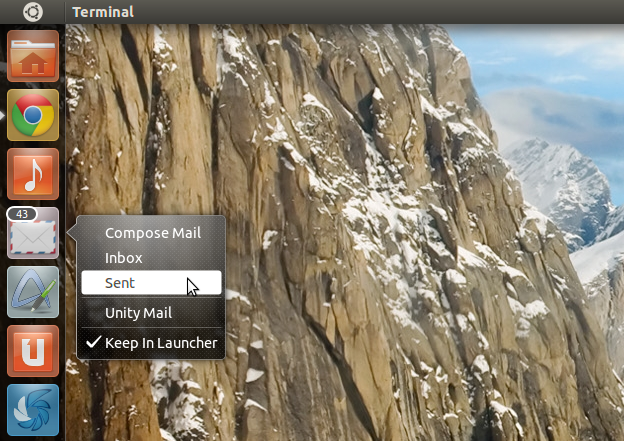 'UnityMail' Shows Unread GMail Count on Ubuntu Unity Launcher - OMG! Ubuntu! UnityMail is a small Launcher-based mail-alert app for Ubuntu 11.04 capable of displaying the number of unread messages in your inbox. UnityMail also has Unity Quicklist support, with a menu containing easy links for composing new messages and accessing your inbox by right-clicking on the launcher icon. UnityMail works with GMail or any other IMAP-supported webmail account. It also supports the use of multiple accounts. Accounts are added to UnityMail by editing a hidden configuration file in your Home folder – ./config/unity-mail.conf – with a text editor, adding your account username, password and server address. UnityMail saves your account details in plaintext. This means your password is kept with no encryption or added security – someone could simply open the .unity-mail.conf‘ file and read your password straightaway. With this in mind I would suggest anyone eager for Unity-based mail alerts to try out Postler, Thunderbird or Evolution before considering UnityMail.